If you’re reading this, I know what you are thinking. You need a way to get around that is fast, convenient, and not affected by traffic jams. I am the exact same way. I am currently a student and with how long and tiring school is, I do not want to take a long bus ride. My solution? The best folding electric scooter I can get my hands on. Electric folding scooters are a good choice for someone who needs transportation that is easy to store and simple to use. I love the ability to fold it and take it wherever I need it after I am done riding. Knowing that I can safely get around while still having time for my studies makes these scooters worth every penny. Never waste money on the bus again. Save money by using your car less. Feel better about your ecological footprint on the planet. There are so many reasons to consider buying a scooter. They are motorized and light-weight. They are an ideal way to get around the city without having to deal with the traffic. Electric scooters are an especially good choice in the hands of a student who needs to get to their next class for example. Scooters are a great option for commuting to work and back or just going out to take a ride through your neighborhood. At the end of the day, this why they are an absolute perfect option for me and I am sure they will be for you too. When it comes to scooters, I like to look out for a few specs to make sure I am getting the best use out of what I buy. For me, speed and battery life is the most important factor for a good scooter. I want to actually get to where I need to go without running out of battery power. And ideally, I would like to get back home too. After battery life and speed, I care a lot about the weight of a folding scooter. So, with these things in mind, I will rate these scooters out of five stars based on their affordability, durability, and reliability. Without further ado, these are my top five picks for the best folding electric scooters. The best folding electric scooter if you can afford it. The motor is powerful and the battery has enough capacity to run for over 60 miles. Motor Power:800 Watts with 26Ah 48Volts 5C powered lithium battery. Max Drive Distance:100KM Dual shock absorber perfect for 45 design up to 1 million times the compression rebound. Max Drive Speed:55KPH２Second Quick-Folding 10 inches pneumatic tire and insulation design. This is by far the best folding electric scooter I have ever used before. It drove like an absolute dream and the sheer distance it can drive is incredible. This will always be the scooter I turn to when I need to get somewhere quickly. I am in love with it. It is very expensive, but this scooter could easily replace your need to use your car so often. It will save the money that is going into it, without a single doubt. Not to mention, lessening your ecological footprint. This is one of the best folding electric scooters for its many impressive features. It has an 800-watt motor that has the ability to go 100 kilometers on one charge. But its feature I adore is the dual shock absorber. It just makes it so much easier on the knees and ankles to drive around should I hit some unfavorable terrain. It is waterproof so the frame is extra durable. This scooter can cruise up to 55 kilometers which is honestly perfect for traveling around the city as quickly as a car would be able to do. But the benefit is that you do not have to deal with traffic. I love taking it to school with me and not needing to take a lengthy city bus ride to get home. However, despite everything I have said thus far, one of my favorite features of this scooter is that it has the capacity to charge a mobile phone through its USB slot. The scooter is equipped with a brake light and it has a max carrying capacity of 550 pounds. You do not have to worry a thing about weight while on this scooter. All of these features is what makes this my all time favorite scooter and it is definitely the best folding electric scooter money can buy. I cannot recommend this scooter enough to you. Despite how expensive it is, it is definitely worth the price. Affordability: 2/5 stars. While this scooter is extremely expensive, I insist that its features outweigh its price. Reliability: 5/5 stars. This scooter can take you anywhere. Durability: 5/5 stars. 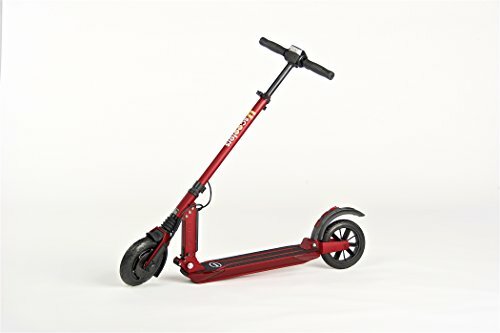 Due to how heavy it is and the material it is made out of, this scooter is extremely durable. In conclusion, the Q1Hummer is absolutely amazing. 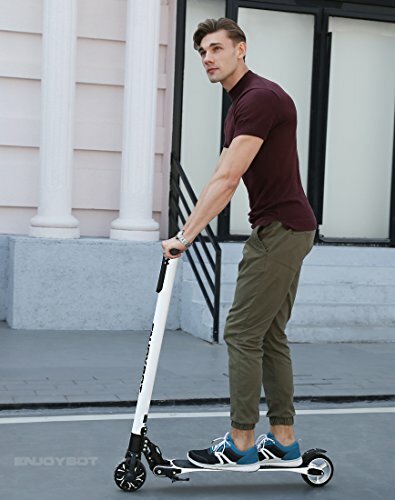 If you are going to invest in the best folding electric scooter on the market, I highly recommend this one. While expensive, its features make up in its price. With how much gas I have saved through using it, and how much I enjoy riding it, this scooter is my number one recommendation. Very portable folding electric scooter with good top speed and some nice extra features, such as cruise control. 3 point folding system takes the scooter down to 38 x 6 x 12 inches and it's under 24 lbs, carry it anywhere or pull it along in trolley position. Double braking system, one on handlebar for electronic motor brake and a foot brake for motor brake and friction brake on the back wheel. KERS (kinetic energy recover system) expands battery life. While this scooter is definitely more expensive, I found it so worth the extra money. I love that it has adjustable handlebars. I am a bit short, so being able to adjust it to a more comfortable setting is a huge bonus. This scooter also has a pretty good battery life and is able to go up to 18 miles per hour. It can carry a max load of 290 pounds, plenty for me even when I have to carry so many textbooks in my bag. This is definitely one of the best folding electric scooters that you can buy without breaking 1000 dollars. Though, it is cutting it quite close. I had so much fun zipping around on this thing. I used it to get to and from my classes and also to drive around town on. Its lightweight enough that I am able to carry it with me without causing too much strain. And it has a horn, which is a feature I missed off of some of the other entries in the list. It can come in handy when you are trying to navigate through traffic. But my favorite feature by far is the cruise control. It is just such a relaxing and good feature to have on a scooter. 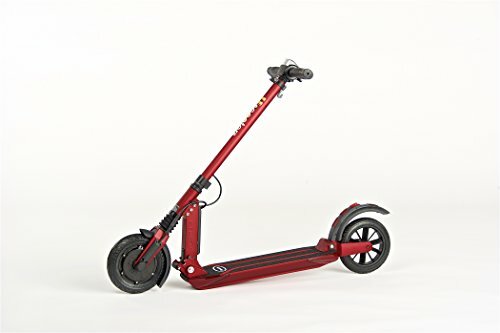 If you are willing to spend a bit more money, I highly recommend this scooter. It is fast, it has a decent battery life and its maximum carrying capacity is something to buy it for without much other reason if you are a relatively large person. Finding something that can carry this much and also have the amount of battery life it does is not so easy. It comes in the colors grey, green, black and white, so there is a wide variety of options when it comes to customization. I had the green one and I felt pretty fancy on it. Affordability: 2.5/5 stars. This scooter is definitely on the pricey side so it is not an ideal buy for everyone. However, if you are more serious about having a scooter and want a long-term buy, this is an excellent option. Reliability: 4/5 stars. With 21 miles a charge, it is very reliable to get to where you need to go. Durability: 4/5 stars. Due to this being a little heavier, it is more sturdy. In conclusion, the Booster Plus is a great buy for anyone who desires an alternate form of transportation. Whether you need to commute to work, school or to a friend’s place, this scooter can handle it. And using a scooter instead of other means of transportation leaves a smaller ecological footprint. The best folding electric scooter for everyone that intends to take this on a bus or train thanks to how it can be transformed into a rolling suitcase. Very portable. This feature definitely makes this a very attractive scooter for anyone who needs to commute to and from work. Or even school. Decent battery life with 15 miles a charge. Considering its unique features on portability, I did not worry about the battery life. I had a lot of fun with this scooter. It feels more mature than the Enjoybot Scooter, but it is just as portable. If the Enjoybot is great for kids, this option feels like it’s great for the adult. It’s so versatile, I loved its functions and how easy it was to get around my city on it. However, the feature that I, without a doubt, loved most is its unique portability feature. I absolutely love the function that turns it into a rolling suitcase-like bag. It’s unique to this model and I have not seen anything like it before. With just a few seconds, I can turn my fully functioning scooter into what appears to look like a golf-club case or a small bag on wheels. It is great for anyone who has to do part of a commute to work on a train or bus. The wheels allow it to be transported so very easily. It is, without a doubt, its best feature. If you are looking for a good scooter to commute to work with, this is absolutely one of the best folding electric scooters to do the job. I recommended it to a friend and they are absolutely addicted to it now. They have pretty much entirely abandoned their need for a car, which makes everyone, including the planet, happy. With the ability to save money on gas, lessen my ecological footprint, and have this scooter’s unique portable feature at my disposal, I could not say no to it. I loved using this for every moment that I did. Should I ever need a lighter scooter to go somewhere, I will definitely take this one out to use. It is absolutely undeniable that it is incredibly useful. 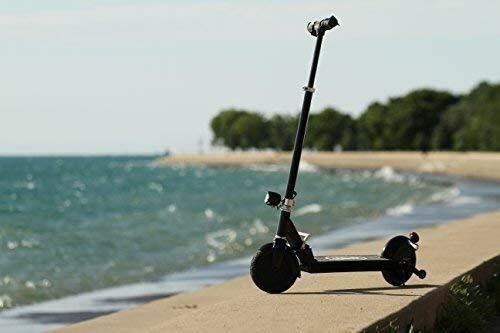 The scooter comes in black and has an aircraft-grade aluminum frame, so it is very lightweight. In fact, its portability feature made it feel even more lightweight than it actually is. Which is always a bonus. It has a 15-mile battery life and takes about three and a half hours to charge, which is actually pretty average for a folding electric scooter. However, one of the things I very much loved about it was its airless tires. I did not have to worry about air seeping out or getting a flat tired due to its honeycomb tire design. It’s such a relief to only have to worry about battery power when it comes to a scooter and not flat tires. Or worrying about the absolute right tires to buy for optimal speed and weight capacity. This scooter is more than worth its price and is definitely a steal with its unique features. It is a great option for commuting due to how easily portable it is. Not to mention, it has an incredibly quiet 250-watt motor. Its max weight capacity is 255 pounds, which is a really solid compared to some other models. Anything that could carry more would have to be built with many more materials and therefore be more expensive. Unfortunately, it is a little on the heavy side, with its overall weight, including the battery, coming in at 28 pounds. However, its portability and ability to be dragged around like a suitcase really help with that. There is never a need to carry it by hand. And picking it up to get it over ledges did not feel like a chore to me since I was dragging it everywhere when I was not riding it to begin with. Affordability: 1/5 stars. For its features and battery life, I feel this is on the expensive side. However, if money is not a problem, this scooter is a really solid buy. Reliability: 3/5 stars. It has decent battery life and its ability to be so portable makes it very easy to bring anywhere. Absolutely worth it if you need to take a train at some point during your commute. Durability: 4/5. Its aircraft-grade aluminum frame is high quality and rust resistant. This scooter should last years if well taken care of. In conclusion, the Glion Dolly is a solid scooter. It has some features that are truly unlike anything else, mainly its portability and tires that do not need air maintenance. This is definitely one of the best folding electric scooters for anyone who needs to commute from work or to school. However, this is definitely a scooter that is solidly for adults. I would not put this in the hands of a child. In fact, it says right on the Amazon page that is not a toy and not intended for anyone under the age of sixteen. Portable electric scooter that is ideal for teens that want to commute short distances or just have some fun! Very lightweight. With a carbon fiber frame, it only weighs 15 pounds. Very affordable. Considering this is a great buy for kids, this could easily be an awesome holiday or birthday gift. EASY CARRY-This folding electric scooter, only 15pounds, is just what you need to zoom around town. Perfect for fun, recreation, or even commuting to school or work. Conveniently 1second folds into tight space to store in trunk, hatchback, or simply carry by hand. 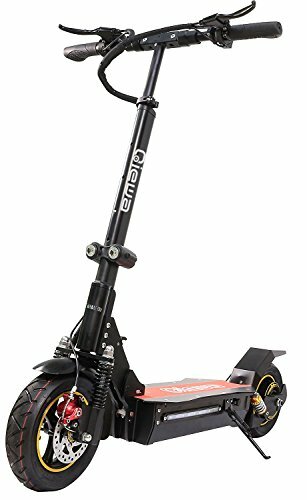 MORE POWER-Enjoybot H3 Electric Scooter has 250W powerful motor with noiseless that help it climb slopes as steep as 20degree and 8miles max. range on a single charge. SMART DISPLAY-The control panel allow you to check the speed level, battery remaining capacity & running time & current speed. SAVE ON GAS- Save lots of money and time by taking this scooter along with you on the train, subway, or bus. Now you can step off the bus with this light scooter and quietly zoom to your final destination. 1Year Limited Warranty covers parts and labor from the manufacturer; Service after sales in CA, United States. I got this scooter for my nephew and he loves it. He rides it around the neighborhood, to school, and to the skate park to hang out with his friends. It is easy to use and operate, so even a child of twelve could use it without trouble. It’s the perfect weight for him, coming in at only 15 pounds. He can pick it up and carry it around fairly easily. The model is extremely lightweight and super easy for anyone to use. However, I would say the feature my nephew loves most is the ability to take it to school since it’s compact. That way, he does not have to go through such a long bus ride to get home. Being able to cut off so much time of his commute, he’s able to go home and get his homework out of the way immediately. After that, the rest of the night is free for him and he is happy. This scooter is a great way to reduce your ecological footprint and save some money on gas. It can go eight miles on one charge and travel at 16 miles per hour, which makes it a good choice for an older child, like my nephew. With a helmet on, I do not worry. And because it is so lightweight and small, he can fit it right in his school locker. The scooter has a 250-watt motor, which is also perfect for someone who wants to use a scooter for fun. This model can be bought in black or white and has a noiseless motor. It can handle up to 220 pounds in weight. It has a smart display to check the remaining battery life and speed. And best of all, it can be charged anywhere and it only takes about two hours to charge. This is the perfect buy for an older child or teen who just wants to have some fun. When going on a bike ride, your child could take their scooter and they would have a blast, especially since it is motorized. My nephew spent the summer zipping around our road repeatedly just because he loved being outside on it. It is a great way to get your kids out of the house, off the computer and enjoying the fresh air. And it’s done in a way that makes them feel good and happy. They do not feel like they are being pushed outside to enjoy themselves. This is perfect for getting around while having fun. Affordability: 5/5 stars. This folding electric scooter is extremely affordable. It is a great gift idea for recreational use. It is a great alternative to long bus rides for older children. Reliability: 2/5 stars. 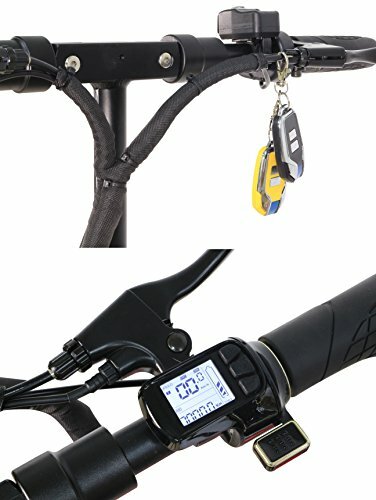 Its battery life is on the short end and it does not get as fast as other scooters on the list. However, when considered that this scooter is more fit for recreational use, that is not such a problem. Durability: 3/5 stars. Its frame is very lightweight so it is not as sturdy as some other options, however, it is extremely easy to carry around. It is so easy to carry around that an older child can do it without any strain or problem. In conclusion, the Enjoybot is great for the whole family. It is definitely one of the best folding electric scooters to invest in for your children or even a gift for a friend. It is great for light commuting and recreational fun. I highly recommend it as a way to get your kids outside to play, especially during the summer. Being able to go at 16 miles per hour cools them right off when it is so hot. If you want something fun for the family to do, this scooter is definitely an option to consider. You will not regret the buy. Just remember to always wear a helmet! Very affordable and versatile electric scooter that is ideal for anyone on a tight budget. It is lightweight. Because of its ultra-light carbon fiber frame, this scooter can pretty much be taken with you wherever you need to bring it. The ability to choose between two batteries helps you focus your budget on what you need. It is compact and easy to store. The body is covered with a corrosion-resistant powder to extend the life of the scooter. The motor is ultra quiet. It’s great for being able to hear the traffic and sounds around you, to make your trip safer. Super affordable. The price of this scooter is incredibly affordable for what it can do. Eight-inch military-grade pneumatic tires must be used in order to properly reach its intended speed. Without those specific tires, it cannot hold up its maximum weight capacity of 120 kilograms. It has some issues with hills. It can only handle slopes of less than 15 degrees, so if you live in an area that is very steep, it might not be the right scooter on this list for you. It is a little less durable than some of the other options on the list. You are allowed to change the replacement parts for free in three months. Packing: scooter, charger, suites and instruction. I love this scooter. It is affordable, convenient and lightweight. It is perfect for a student who does not want to wait for a bus to get around, like me. It is able to travel up to 40 kilometers an hour and can carry a weight up to 120 kilograms. It has two battery size options and an electronic anti-lock brake to provide extra safety for the user. 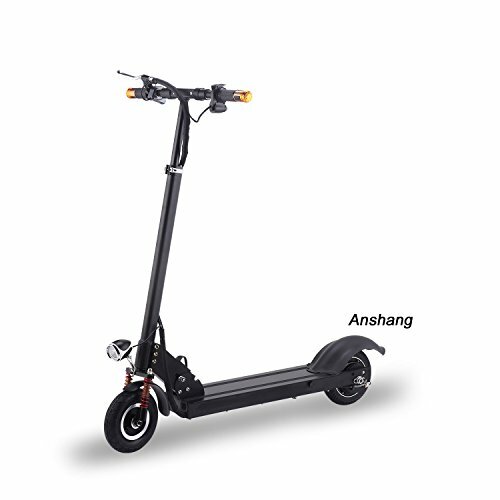 The Anshang scooter comes in black. This product worked like a dream for me. It easily got up to its average speed and I was able to get to and from classes without issues. I really love how fast it goes and how easy it is to weave through traffic. I used it a lot during the fall and I had very little issues with it. 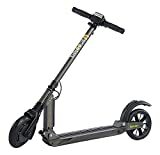 It is a very good scooter to buy if you are interested in trying out one or just need one for a temporary time. I would highly recommend this as a basic staple for a student who needs to get to and from the university as that is what I primarily used it for, other than going to the occasional movie. This electric scooter is particularly good for how fast it can go. 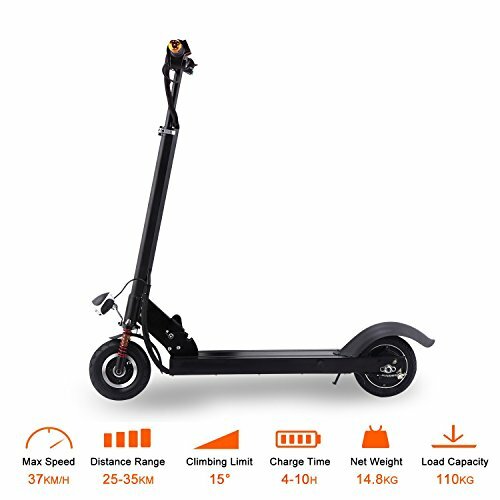 With being able to get up to speeds of 40 kilometers, it is the second fastest scooter on the list and it is definitely worth its price with that kind of speed. It is rare to find such an affordable scooter that can go that fast. And if you are on campus already and not commuting, even better. The scooter is so easy to store that it will fit right into your dorm room and be easy to grab on your way out so you can get around the city. This is what I primarily loved using this scooter for. Not to mention that being a student is already so costly, so not having to pay for the bus whenever I needed to go somewhere helped me out so much. I didn’t have to eat cup noodles anymore. Affordability: 5/5 stars. This folding electric scooter is extremely affordable. Especially when all of its specs are considered, this scooter is an absolute steal. Reliability: 3.5/5 stars. It has some trouble with hills but for the most part, it is extremely reliable. Should you live in a more hill-concentrated area, you may want to consider a different scooter. Durability: 3/5 stars. Due to its ultra-light frame, it is definitely something to be a little more gentle with. I do not recommend taking it off of pavement whatsoever. However, its rust-resistant frame will make it last a very long time, up to years or even more. In conclusion, the Anshang Foldable Scooter is a sturdy folding electric scooter that is great for any first-time scooter buyer or student. It easily navigates on pavements and it gets to a very good speed for its price. I love this model. I love how easy to store it is. It is so lightweight and can be carried anywhere you may need it, so it is extremely portable on top of being affordable. It’s a great buy for anyone who needs an electric scooter but cannot afford to pay a thousand dollars out of pocket. For all the features you get, the price is completely worth it in my opinion. 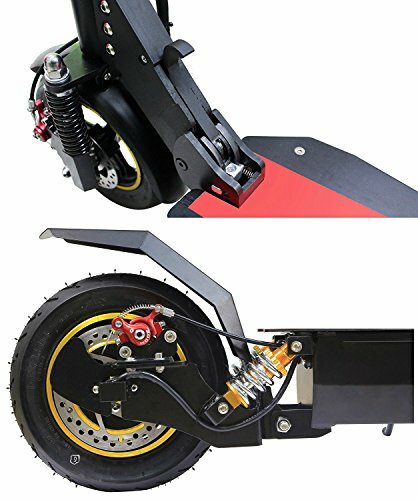 If you need a motorized folding electric scooter, especially if you are a student, I would highly recommend this product to you. I absolutely loved it when I was using it. All of these scooters are great. I have genuinely enjoyed using all of them, but it is clear some of them are more suited to certain needs. Just because the number one pick is the best scooter, does not mean it is the best for everyone. 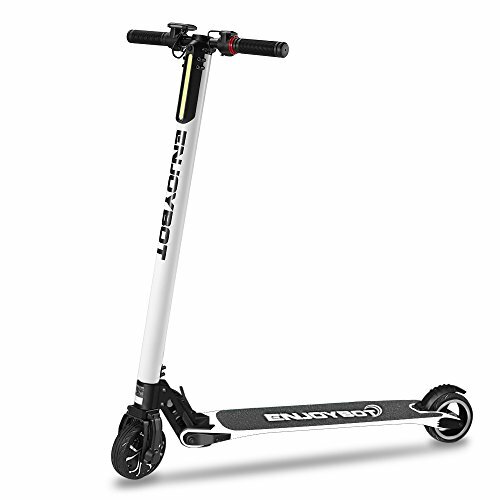 In my opinion, the fifth scooter on the list, Anshang Foldable Scooter, should be an option considered by students. I would not consider buying this for any children or if you need to travel longer distances. 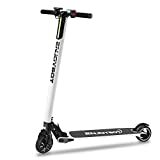 This should be bought if you only intend to use the scooter during the time you are at school, but I would not get it for more long-term use. The Enjoybot I highly recommend for recreation, fun or for children to use. As I told you, my nephew absolutely loves it and it is perfect for him to ride back and forth to school on. But I would not buy it for someone who might need a scooter more long-term. 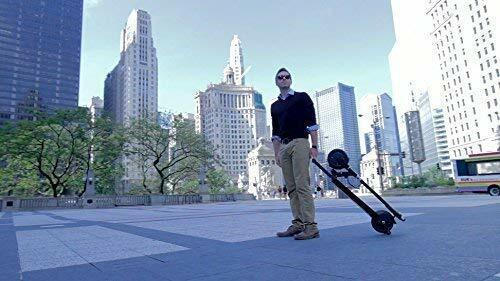 The Booster Plus is a great option for someone who wants a folding electric scooter that is incredibly portable. It is a long-term commitment, but an excellent way to commute to work and back. I would recommend this to adults who are conscious of their ecological footprint and also want to save some money. The Glion Dolly is a scooter I would also recommend for students and those who want to commute to work. It is great to get around a city on and save some gas money. And it is a good way to reduce your footprint. The first, and best folding electric scooter, Q1Hummer, I would recommend to those who really love scooters and want to build their transportation lifestyle around it. It has so much battery life and travel distance that unless you need the extra space, you could use it to replace a car most of the time. This is an absolute great buy for those who want to cut down on how much they use a car and it is a great option to commute to work and back.